Last year I did a summary of New Zealand pop and I noted that it had been a slow year. This year it’s even slower. In 2014, 23 songs by New Zealand artists charted; in 2015 only 15 did. And that’s in an X Factor year. But the chart has been slower in general, due to streaming data now helping determine the charts. So songs stick around for longer – if a song is popular on Spotify, it’ll still chart. But somehow songs by New Zealand artists usually aren’t popular streaming choices. Of the top 100 tracks listened to by New Zealand users of Spotify in 2015, only four were by New Zealand artists, and of those, three were by Six60 (the other was Savage). I have a few theories as to why this is happening. We speak English so we can happily listen to music from other English-speaking countries, without the need for a local music industry making music in our native tongue. And it means that local English-language pop is up against the best from the UK, America and Sweden. New Zealanders have a weird attitude towards pop, the national equivalent of a teen who has started wearing black and declaring that they only listen to “real” music by “real” artists who play “real” instruments. 15 years ago, “supporting New Zealand music” meant buying physical recordings. But now, once all the friends/fans/family buy the mp3, a song needs to be genuinely popular for it to make an long-term impact on the chart. That’s hard to do if the song isn’t a keeper. It’s hard to get behind amazing pop from New Zealand artists when there just isn’t a lot out there. But there were still some good tunes released in 2015. Here are 10 in some sort of order. Disclaimer: If you haven’t listened to chart pop since the ’90s or whenever, you will probably not enjoy anything on this list and should probably just go off and listen to your Smashing Pumpkins compact disc. Praise the Lorde. No matter what else New Zealand artists release, we still have Lorde to come along and make everything ok. “Magnets” was a cool and saucy piece of electropop, in collaboration with UK production duo Disclosure. 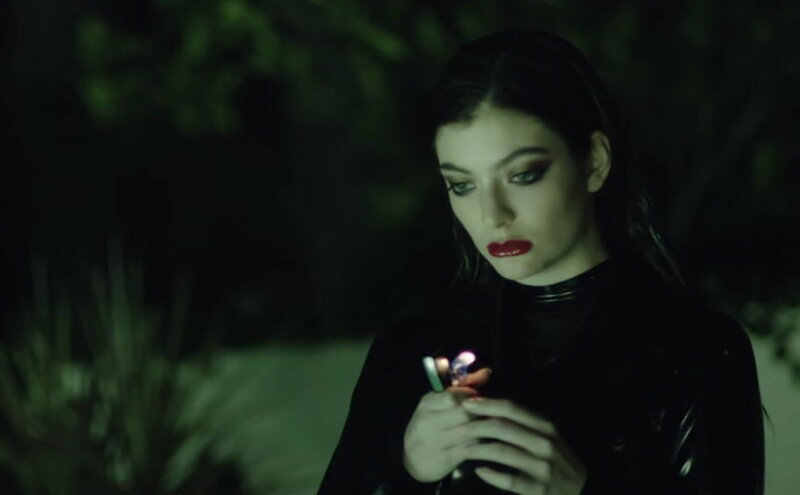 The video has just as much effort put into it, imagining Lorde as a sci-fi SoCal seductress hitwoman. The musical equivalent of #redpeak. This was the only New Zealand song to reach No.1 this year, following one-man-band Avalanche City’s previous chart topper, the cheerful “Love Love Love” in 2011. “Inside Out” is bleak, the heartbreaking tale of a broken relationship, and it seems perfectly attuned for the “crying into a glass of Chardonnay” demographic. For ages MAALA’s record company wasn’t saying anything about him, letting his music speak for him, etc. Then finally his true identity was revealed – Evan Sinton. Wait, who? Why was his name obscured? Oh, because he was a contestant on series two of New Zealand’s Got Talent which is approximately the least cool thing ever. As MAALA, Mr Sinton got to reinvent himself with some cool indie electro pop styles, far removed from his crazed NZGT fans and reality TV haters. 2015 was the year of Wigmore dropping the twee folksy pop of previous years and fully embracing her tattooed, pierced, punk-arse style. “New Rush” was noisy and obnoxious and her live performance of the song on The X Factor was one of the few bright moments on that train wreck of a series. The “New Rush” video is very slow-mo Hunger Games. I was going to include Ginny Blackmore’s “Love Me Anyway”, but it throws in an old-style-Eurovision key change and I cannot be seen to condone that sort of behaviour. Instead here’s “Under My Feet”. Blackmore is a good songwriter and a good singer, but a less convincing pop star. But nonetheless, “Under My Feet” is a really enjoyable piece of diva pop. Despite the general awfulness of series two of The X Factor, the winner’s single most unexpectedly ended up being an original composition and one featuring lots of beatboxing. It reached No.2 in the charts, 26 years after Double J and Twice the T’s beatbox heavy song “She’s a Mod/Mod Rap” also charted at No.2. Tbh, I don’t really enjoy beatboxing (ugh, mouth noises), but other people do and this song deserves a mention. In theory, this song seems like it should have been a hit – Stan Walker singing the theme song of a hugely popular dance movie feat. Parris Goebel. But what was it up against in the chart? Really cool stuff like “I Can’t Feel My Face”, “Lean On” and “Where Are Ü Now”. Stuff that makes “Start Again” sound so 2013. It had woah-oh-ohs when it should have had heys. How does streaming (or lack thereof) affect the modern charity single? Compare and contrast with the Flight of the Conchords’ 2012 charity single “Feel Inside”. It debuted at No.1 and spent 12 weeks in the charts on sales alone. Whereas “Team Ball” was released in the wild, uncertain world where streaming data contributes to the charts. It debuted at No.2, then quickly dropped to 33 and disappeared entirely the next week. Arguably the song wasn’t as strong as the 2012 single (essentially the same comedy format rehashed), but it wasn’t bad. Just not the sort of song that can even come close to standing up against Bieber and Goulding with streaming. 2015 belonged to Six60, so I have to include them. “White Lines” is like a New Zealand version of “Semi-Charmed Life”, a song about taking drugs which matches the manic energy of the drug in question, making its upbeat groove hugely appealing to listeners. Just like cheap speed. Or it can also not be about drugs and just be about getting high on life because New Zealand. It was a double-platinum hit for Six60. And check out the video: made from fan-submitted clips, it shows dozens of New Zealanders hamming to the camera as they get down to their favourite song by their favourite band and it doesn’t even matter what the song is about. A band like this – with their charming, old-fashioned undergrad reggae-pop – can only be huge in New Zealand, but they are properly huge. Before Rachel Platten’s original version of “Fight Song” had even been released in New Zealand, The X Factor final 12 covered it for charity. Despite the individual talents of the contestants, it sounded more like a group rehearsal exercise than a cohesive performance. And then bloody Brendon Thomas jizzed a guitar solo all over it, like it was the 1980s and/or Albania. The X Factor‘s version disappeared from the top 40 after two weeks, while Rachel Platten’s version (sans guitar solo) quickly shot up the charts and became one of the biggest songs of the year. The X Factor version of “Fight Song” symbolises everything that was wrong with series two, post Kills/Moon.